I love mughlai food. 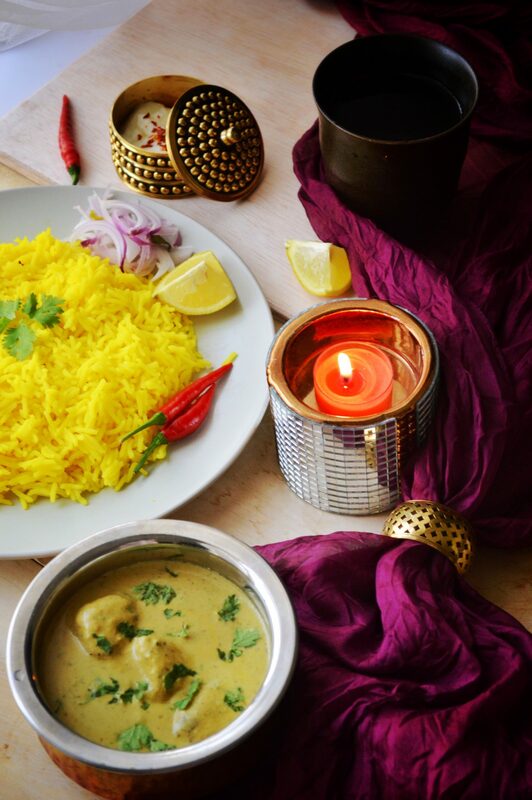 The famous mughlai cuisine was developed in the royal kitchens of the mughal emperors in the Indian sub continent. Their food is very rich and flavorful. 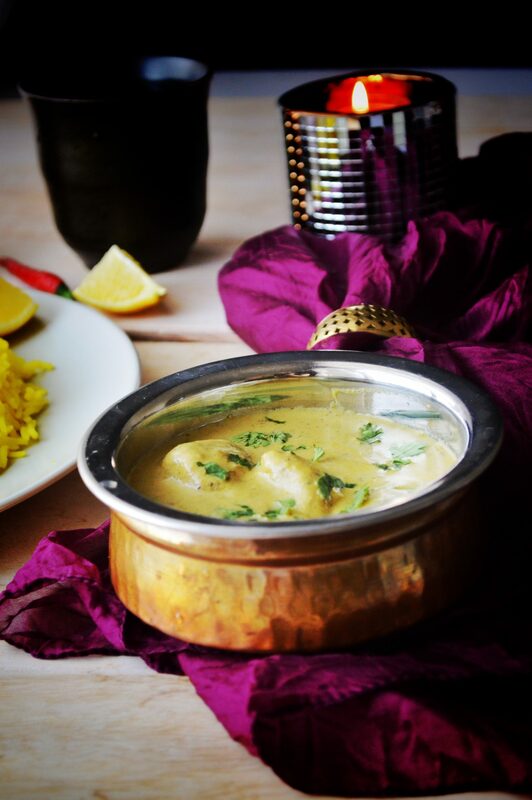 Nuts, saffron, cream and whole spices like clove, cardamom are a must in their cuisine. Whenever i visit a north Indian restaurant, i get soo excited to order from the huge list of mughlai dishes they have. Murgh musallam, nihari, kormas, reshmi kebabs, rogan josh, zafrani pulao etc etc. 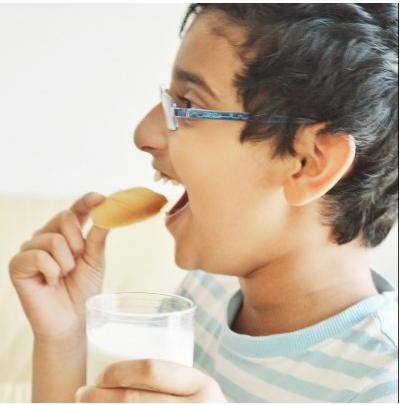 The mughlai desserts are just another world, its better i don’t talk about it now. This curry i am presenting here today is a result of many trial and error. This, my friends, was the best mughlai curry i made so far. 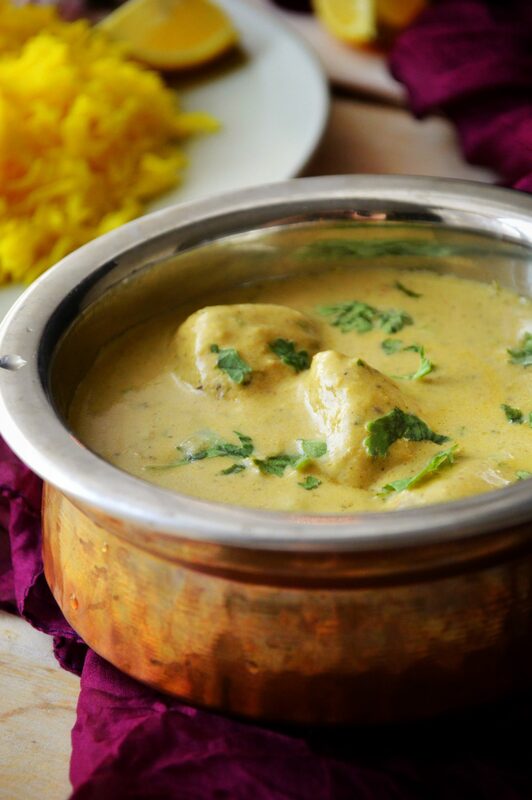 Oozing with richness and flavor, just the thought of dunking a piece of roti in the creamy gravy makes my mouth water. 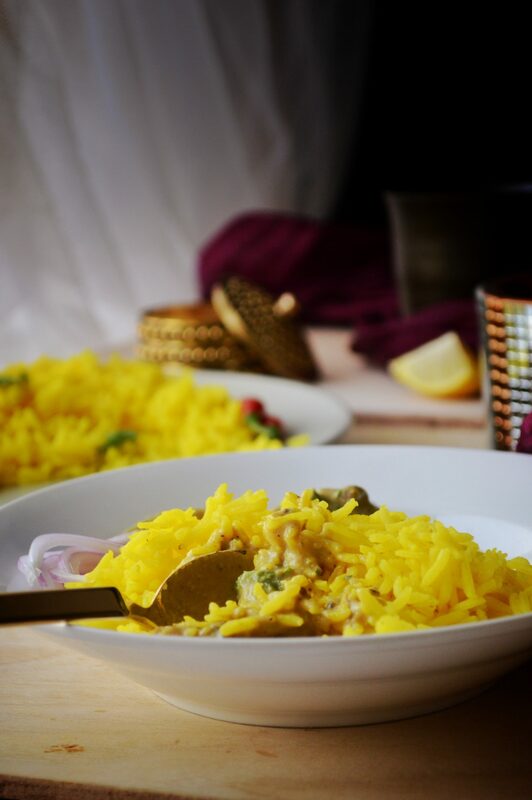 Loaded with ghee, cashewnuts, saffron and cream is not for the faint hearted and so can be enjoyed only occasionally. But, maaaan! It is worth that extra pound you may gain, its soooo good. 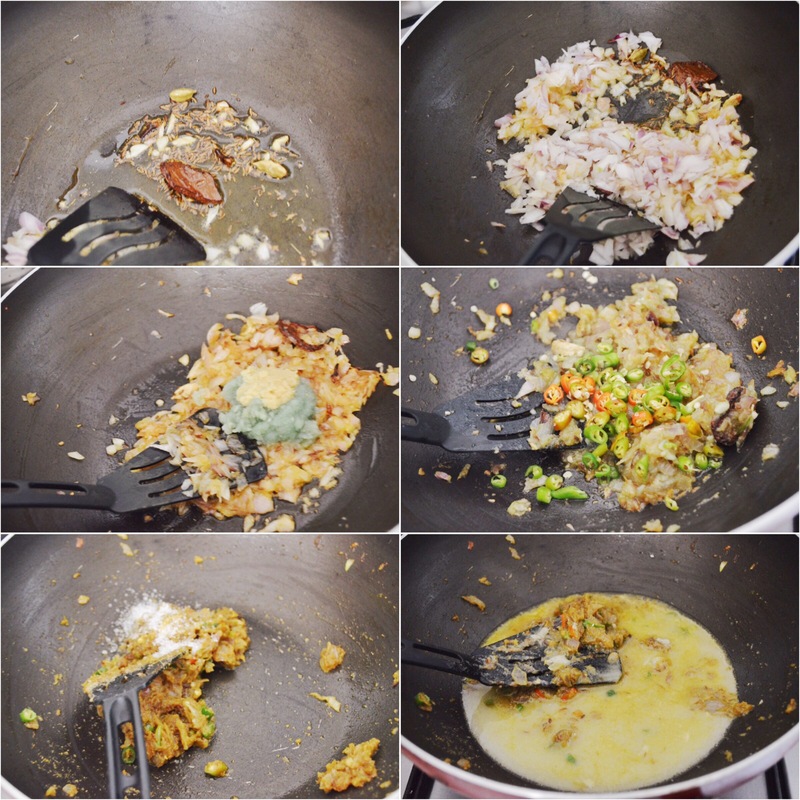 Here is how i made this curry. Even though the list of ingredients look so long, if you have all your spices ready, it’s rather easy to put all of it together. ✔️ if you dont like the flavor of saffron, you can omit it. You can use kewra water too for the aroma. ✔️ The chicken can be grilled too. ✔️ The cashew and almond can be made into a paste at first and then added to the gravy, then the gravy need not be blended. ✔️ You can adjust the heat by altering the the number of green chillies used. ✔️ To make saffron milk, take few strands of saffron and put it in 4-5 tbsp of milk and heat it in the microwave for few minutes. Take out, cover it for 5-10 minutes. The saffron with impart its color and flavor into the milk. ✔️ You can add chicken stock instead of water for more flavor. Marinate chicken in the above listed ingredients and keep for a minimum of 1 hour or better overnight. 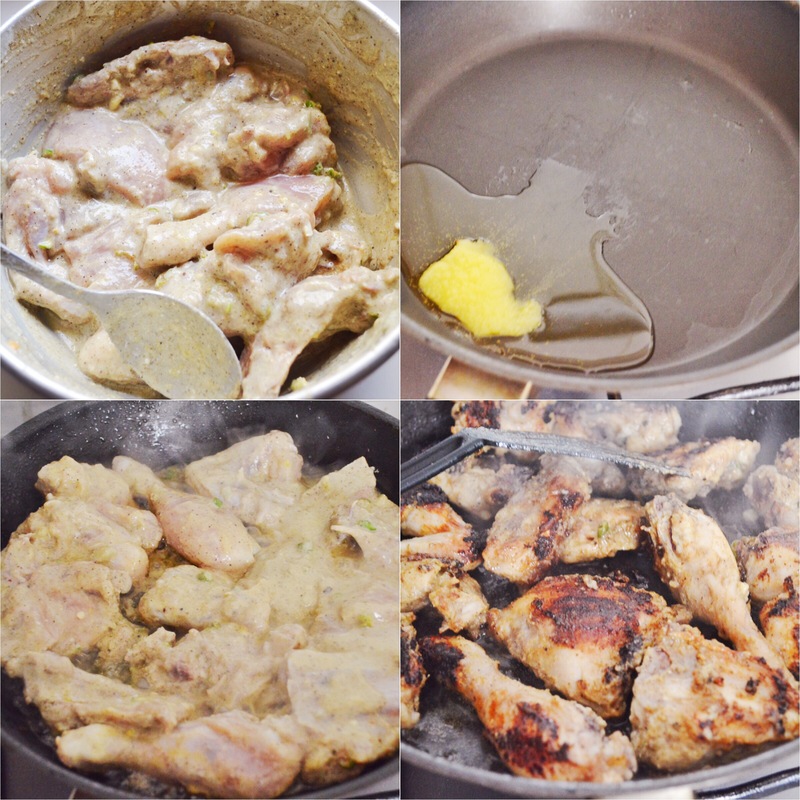 Heat ghee in a pan and shallow fry the chicken on high flame till the chicken is charred on all sides. Heat 2 tbsp ghee in a pan and add in whole spices and sauté till aroma released. Add in the onions and sauté till onion turns soft and light brown in colour. Add in ginger garlic and stir for 2 mins. Add in the green chillies. Add in the garam masala, coriander powder, and nuts. 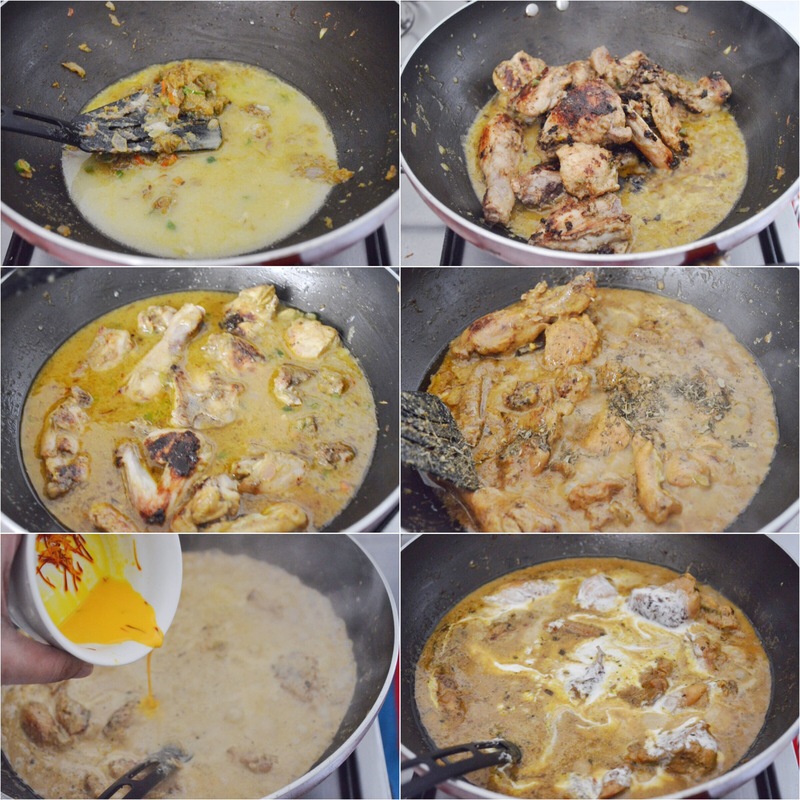 Remove the cinnamon, cloves and cardamom from gravy. Pour 1/2 cup water. Blend this mixture till the gravy turns smooth. Bring this back on flame and add in the chicken and water and salt. Cover and cook for 10 minutes on low flame. Add in crushed kasuri methi, and saffron milk. Bring to boil. Reduce flame and add in cream. Garnish with coriander leaves. Serve hot with naan, rice or any sort of roti. 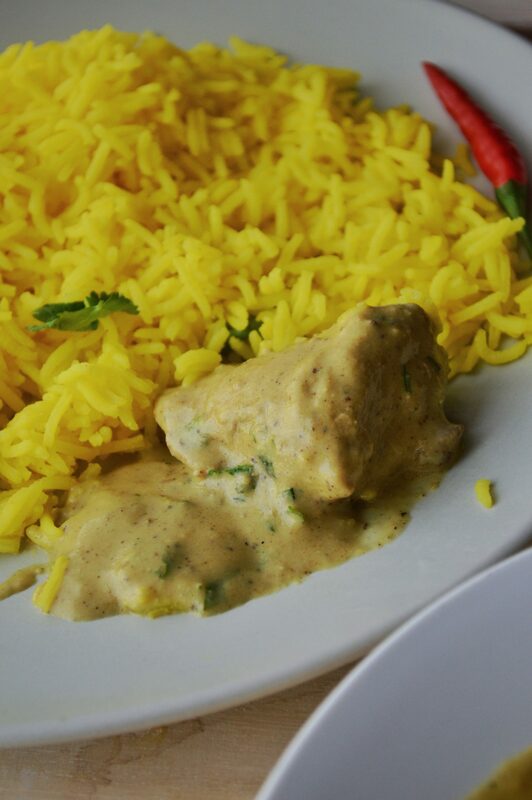 A very rich and creamy chicken curry. * If you dont like the flavor of saffron, you can omit it. You can use kewra water too for the aroma. * The chicken can be grilled too. * The cashew and almond can be made into a paste at first and then added to the gravy, then the gravy need not be blended. * You can adjust the heat by altering the the number of green chillies used. * To make saffron milk, take few strands of saffron and put it in 4-5 tbsp of milk and heat it in the microwave for few minutes. Take out, cover it for 5-10 minutes. The saffron with impart its color and flavor into the milk. * You can add chicken stock instead of water for more flavor. Thanks a lot Jesi! 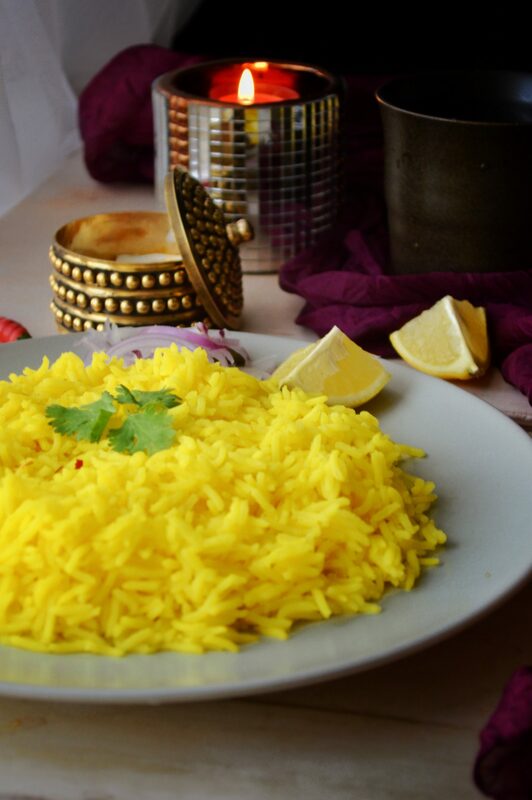 That is saffron rice which i made. Its just normal ghee rice in which i added saffron. Lemme know if you need detailed recipe k. If you do need, i don’t mind making a separate post for that. I adore the photography of this! 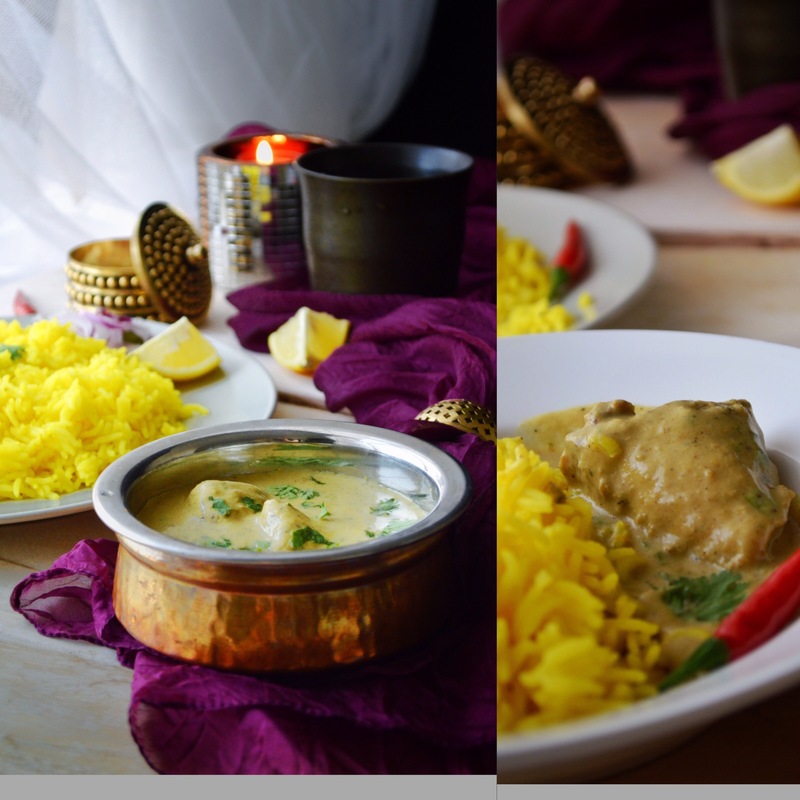 Desi curries are so hard to photograph, and you have nailed it here! Thanks a lot Henna! I just remembered abt the Eid party invite you had sent earlier now. Im so sorry I didn’t participate. I was in India for Eid and was not active in blog during that time.